Hastings also lays bare the failures of Allied intelligence, including long periods when British or American wireless communications were intercepted and decrypted due to security weaknesses. He suggests, however, that these Allied lapses may, in the long run, have been unwittingly advantageous. The Nazi military machine may have been encouraged to believe that their Enigma and Geheimschreiber cipher machines were invulnerable to Allied codebreakers because there was no hint at all of any Allied breaks of German ciphers in any of the Allied messages, especially British naval communications, that the German military could read. This led them to conclude that an enemy who could crack German messages would have the sense to plug the holes in their own systems. In reality, the work of British and American codebreakers was becoming critical to Western Allied military operations against Germany although Ultra did not start to fulfill this role until late 1942, by which time it had become obvious that the Germany would, sooner or later, be defeated. Access to the information made available by Ultra did not guarantee military success, as shown by the muddled operations that followed the great success of D-Day and the ‘break out’ from Normandy in 1944 and the failure to predict the Battle of the Bulge. Hastings concludes that ‘The indispensable element in making all intelligence useful, in peace or war, is that it should pass into the hands of a wise and effective leader; if such a person is absent, whether general, admiral or statesman, then even the most privileged information is worthless’. The global intelligence war during the second world war included many pointless operations that saw agents sent to certain death. 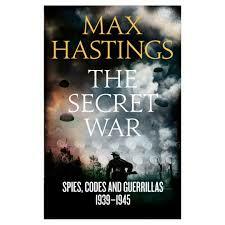 Hastings estimates that perhaps as little as ‘one-thousandth of one percent of material garnered from secret sources by all the belligerents in World War II contributed to changing battlefield outcomes’. This aspect of the second world war is highly relevant in the modern world. As Hastings observes, ‘the importance to national security of intelligence eavesdropping, codebreaking and counter-insurgency has never been greater. Cyber warfare is a logical evolution of the process that began in Room 40 during World War I and expanded vastly’ among British, German and American codebreakers during World War II.